So it sounds like a real possibility, and the only problem is logistics and timing. 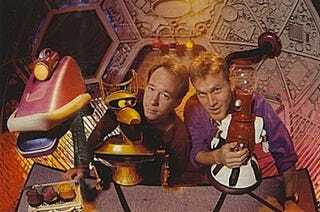 Frankly I would love to see some sort of Cinematic Titanic/Rifftrax/MST3K crossover with the 'Bots and everything, but it sounds like at the very least we can hope for a Joel/Mike team-up. Highlights of the AMA here.